Black and Gold is a pictorial history of the Boston Bruins, one of the NHL’s Original Six teams and among hockey’s most popular franchises. Celebrating their 85th season in 2008-09, the Bruins are a storied team with a long and rich history, and a fascinating cast of characters. Home to players such as Orr, Esposito, Schmidt, Bucyk, Cheevers, O’Reilly, Bourque and Neely, Boston has captured five Stanley Cups as well as numerous division and conference titles. 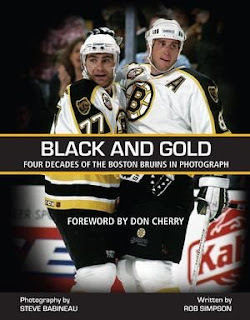 Featuring four decades of pictures from long-time team photographer Steve Babineau, and accompanying text by NESN broadcaster Rob Simpson, Black and Gold will document much of the rich history of the team, including magic moments from the past, star players and coaches such as Ray Bourque, Cam Neely, Terry O’Reilly, Don Cherry, and Joe Thornton, as well as Bruins goalies, grinders, and the old Boston Garden. This epic collection of photographs and commentary from the last four decades, featuring many never-before-seen shots, will be sure to bring back memories for every Bruins fan who bleeds black and gold. Rob Simpson is an established hockey reporter, commentator and writer. He has written a number of magazine and newspaper articles about the game on and off the ice, and also penned the 2005 book Between the Lines, about the Hall-of-Fame career of long-time NHL linesman Ray “Scampy” Scapinello. A 25-year veteran of the broadcasting business, Simpson recently spent three years as a Boston Bruins TV program host and rink-side reporter for the New England Sports Network. He also produced and hosted Hockey Odyssey on the NHL Network. For four years, Simpson produced and hosted Maple Leaf America on Leafs TV in Toronto. His favorite and frequent pastime is travel, which is for fun and business. Presently a Delaware family man off-season, he’s taken a career path less traveled, with previous stops in Alabama, Florida, Australia, Hawaii, and Idaho. Photographer Steve Babineau has spent the last 35 years accumulating hundreds of thousands of images of the Boston Bruins, Celtics, and Red Sox, as well as special event and concert photos from the Boston Garden and the TD Banknorth Garden. Hockey being his first love, the former high school player has dedicated himself to capturing the great moments on and off the ice for the Bruins and the NHL in Boston and beyond. His images have appeared in countless magazines, yearbooks, on hockey cards and promotional items, and on-line. Babs currently runs Sports Action Photography with his son Brian, who began taking photos with dad two decades ago. Undoubtedly the photography will sell the book itself. For publisher Wiley's sake, I hope there are lots of Boston Bruins fans out there, because at a list price of $38.95 Cdn, this is one of the most expensive books in the upcoming season.